He was an amazing Dad, an example and inspiration. He was a kind and generous man, a liberal firebrand, an Air Force Colonel, a peace activist, a scientist, a professional counselor, a national champion gymnast, a skeptic, and an author. He was a wonderful husband and loved Mom with all his heart. He never stopped learning and he was always excited to be alive. 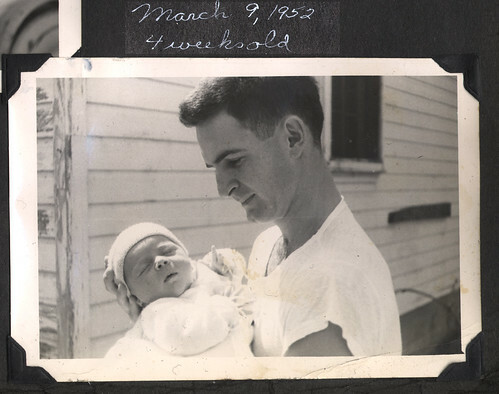 Dad and Me. Dad loved to play with kids. I got that from him and became an elementary school teacher. I will talk about some moments I shared with him, moments that I cherish because in them he was so much himself and I had the privilege to be there. Dad was very tolerant of my love for fishing. He disliked pretty much everything about it – the worms, the waiting, the fish. But out of love, out of duty, once or twice a year he would load me and my gear in the car, find a lake and indulge his son’s perverse angling passion. The first fishing trip I remember happened in my third or fourth grade, around 1960, Tallahassee, Florida. We went to a city lake set in a small park surrounded by working class houses. I am pretty sure it was just the two of us. I don’t remember whether I had a single nibble or caught a fish. What I do remember is two black children, boys about my age fishing just down the shore from us. A police car stopped and the officer got out of the car and talked to the black kids. They were far enough away from us that we didn’t hear the conversation. As the officer returned to his car the kids began to pack up their fishing gear. Dad said, “Let’s go talk to them”, and I put down my pole and followed him. Although he knew the answer he asked them what the policeman had said. “This lake is for white folk”, the older said, not looking at Dad, continuing to pack. “That’s not right. Stay here and fish. You can fish with us.” Dad was angry. The boys gathered their last things up as Dad tried to convince them to stay. They walked away from the lake leaving Dad outraged and leaving me with a memory I am so proud to remember and to share. What a superb example to give me. Dad saw an intolerable injustice and he didn’t look the other way. He went right at it and did all he could to set it right. It was exactly like him to be naive about what it was possible to accomplish, what it was possible for two small black children to do in Tallahassee in 1960; he did his best to instigate an act of civil disobedience. It was the law that the lake was for whites only, the law was evil, therefore he had to encourage others to break that law. Dad and Mom were very active in the civil rights struggle along with the UU churches we attended growing up in the south and Washington, D.C. He took me to civil rights marches as soon as I was old enough. I remember marching with him to mourn the little girls blown up in the black church. He attended the March on Washington and heard Martin Luther King give his I have a Dream speech. A very different moment from five years later. Junior high in Oklahoma about 1966. I was talking to some of my friends about my dad. Dad has always been a little hard to talk about to others that don’t know him, because pretty much anything you say about him sounds like you’re bragging. 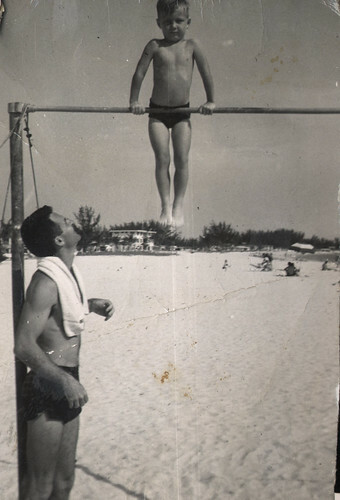 That day I was bragging; I was telling my buddies about a gymnastics trick that Dad could do and they didn’t believe a word of it. So I took my buddies to find Dad. He was in our living room sitting in a high-backed upholstered chair. I told him that my friends didn’t believe me, said that he couldn’t do the trick. So he put his hands down and gripped the arms of his chair, raised himself off the seat, and without touching the chair with his feet curled himself up into a handstand and held it. It was a delicious moment for me, my friends were astounded, my bragging was vindicated, and the glory of my father was unarguable. He later told me that he hadn’t done that trick in many years, wasn’t sure he could do it when I asked him, and that he never did it again. He was about 36. A memory that will be tougher to tell. My family had a great long visit with mom and dad this past Christmas and I had the opportunity to work with Dad on his last woodworking project. It was such a Dad project. He set himself a goal that was almost impossible to attain in his weakened state, to build a large hanging mirror for mom in the Tudor style of their bedroom furniture. He underestimated the time and effort it would take but threw himself into the work with absolute faith in his ability to finish it to his satisfaction. In the week before Christmas we spent hours in his basement workshop working with his power tools. Part of the gift was the fact that it had to be a surprise to mom, not only what it was, but how big a project it was, so we stole hours to work while she was running errands. It was sheer joy to work with him. He got intense pleasure from every stage of the project – designing the piece, cutting the wood and shaping it, assembling the parts, sanding and staining. As the final piece became visible he often smiled in satisfaction and talked about its beauty. On Christmas morning we still had a few hours of work to do. And so at midday when it was ready, we had mom close her eyes and carried it up the stairs and he presented the gift to her. It was a moment of blazing joy – joy in Dad’s pride in his work, joy in Mom’s surprise at the what he had created and her appreciation of his loving labor, joy in Dad’s delight at mom’s reaction to his gift. In my last days with Dad we had a chance to talk for a few hours the way he always loved to talk. We talked about his book Cold Fronts, and he dictated captions for the last few photos he wanted added to the book. We went through a pile of mementos and filed them in various drawers. No Dad, you never told me about the winter of 1983. And so he launched into the last long monologue about one of his favorite subjects – the weather. Weather was one of the big loves of his life. It was filled with beauty and drama. It engaged his love of rational analysis and predictions based on physical principles. He gestured a lot when he talked, and as he told me how the the high pressure ridges formed and diverted streams of bitter cold arctic air into the Midwest his hands curved through the air to mime the vast meteorological shapes of fronts and jetstreams and their movements as the temperature dropped to record lows. He was so proud of how his predictions caused millions of tons of natural gas to be rushed on time to Minnesota and how he called to the hour when his company should restrict the flow of gas because of approaching warmer air. As he talked about the details of that winter he was totally engaged, filled with enthusiasm and intelligence, delighted to share such a wonderful phenomenon with a fascinated listener. 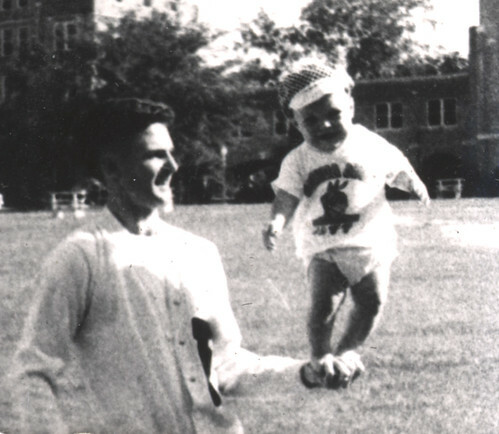 Dad and I shared many things; our shared love of science was one of the most profound and satisfying. Dad didn’t believe in God, didn’t believe in an afterlife, but he believed deeply in the holiness and beauty of the physical world and he had a profound respect for the rigorous honesty of scientific inquiry. Some of his most beloved heroes were scientists – Feynman, the quantum physicist, Dawkins, the evolutionary theorist, Crick, the co-discoverer of DNA. He loved science and of all the sciences meteorology was his passion. And so though I’d heard the story of the winter of 83 many times it was a privilege to watch and listen to Dad as he articulately and animatedly related once again the story of his favorite winter. In his final months there were times, especially when the chemotherapy was biting deepest, when Dad could hardly say a word when I talked to him on the phone, so drained of energy was he. The few words he said were words that I was left to think about. At this time when he was hurting, so much of him was given to me in that word. A word that contains so much of his value and values – the world is full of wonders, it is our job to wonder, the world is good. Of all words it describes my father best – wonderful. This entry was posted on August 19, 2009 by Doug Sharp. It was filed under Uncategorized . Beautiful to feel such a strong love between you and your Father, to read about the love between Your Mom and Dad. It seems so rare in our society today. So very refreshing to know that it can exist. Such a gift to share such a love in his memory. I worked indirectly for Jack at High Wycombe. I will NEVER (I’m 68) forget his calm, rational, calculated approach to facing a disaster (in most cases computer related, I was a programmer in training on the old 418II.) I can see why you appreciated not only the who of your dad, but the what as well. He was loved by all of us who served with him. One of my few heros. Yours is a nice tribute to a fine man. Thank you, Wallace. Dad loved the men and women who worked with him. He was passionate about his work and loved by lots of people. I’m just about to look for an agent for my first book, Channel Zilch, so wish me luck. I read all of Coldfronts and relived some memorable times. Best of luck with your book, Doug. You are about to discover it’s a lot easier to write a novel than to find an agent or publisher. Make sure your work is the best it can be, and submit to people who have worked with a similar genre. Nice tribute Doug. I worked with your father at Northern Natural Gas and also Vortex weather. He was a great man and I learned much from him. Once we were discussing how some people could be disproportially inpacted by uninportant things like their most recent golf score our how the local sports team performed last weekend. I expected Jack to admonish and tell me to focus on the things that really made a difference. His advice was much more practical. He said to go ahead and revel in the joy of victory as long at you can but to forget defeat immediately. It may seem a fundamental concept but I am reminded of Jack’s advice everytime I get bummed about a double-bogey or the NU football team loses. Dad was all for enjoying good things. He had a great smile that he used often. His enthusiasm was driven by genuine delight. Sounds like you were a great discussion partner for Dad. He loved a good conversation. Dad achieved a lot of substantial victories in his life and he savored them. I am a meteorologist working at a military airbase in Asia, and I have been reading your dad’s book. I only wish he were still alive so I could tell him how much I am enjoying it. Thanks so much, Kim. He loved it when people appreciated his work. He was intensely proud of his career in the Air Force – for good reason. Best wishes on your career. Weather is amazing. Dad would have loved to see the advances made in the last decade. I knew your Dad back when we were in Air Weather Service. He was an officer while I was an enlisted man, but he was never full of himself. When my wife and I read about that “Trip to Alaska” we laughed outloud. We lived in Arctic Park while stationed there and I commuted to “Mile 26”. At the moment I am in the midst of trying to convince the VA that my non-small cell lung cancer (which presented in September 1998) was most likely caused by the four years I served with the B-50 Program, stationed in Fairbanks. That was the 58 WRS,.